Only queens with hearts can bleed. This is not the story of the Wonderland we know. Alice has not fallen down a rabbit hole. There is no all-knowing cat with a taunting smile. This is a Wonderland where beneath each smile lies a secret, each tart comes with a demand, and only prisoners tell the truth. Dinah is the princess who will one day reign over Wonderland. She has not yet seen the dark depths of her kingdom; she longs only for her father’s approval and a future with the boy she loves. But when a betrayal breaks her heart and threatens her throne, she is launched into Wonderland’s dangerous political game. Dinah must stay one step ahead of her cunning enemies or she’ll lose not just the crown but her head. Evil is brewing in Wonderland and maybe, most frighteningly, in Dinah herself. First of all you need to know without a doubt Alice is not present in this Wonderland, no rabbit hole has been found. This book is clearly the beginning of a series and I advise you to avoid it if you are not looking to read the whole series. 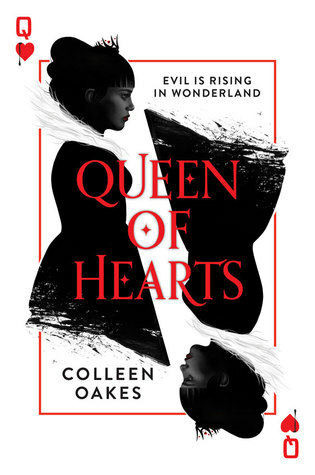 Queen of Hearts is a very quick read geared towards a YA audience, but without reading the whole series you are left with a book that is basically plot filling (interesting but just setting the background for what is to come). I loved this version of Wonderland’s landscape and the twists of some of the characters personalities. It is provocative to see the Queen of Hearts, Dinah, as a young woman facing her own trials growing up. Though the only real trial that everything else seems to revolve around is her father. The whole book wanders the idea that her father holds a large amount of animosity towards his daughter for some unknown and unexplained reason. Dinah spends most of the novel being snotty to everyone around her or terrified of anything involving her father. Only in his presence though out of earshot she has plenty of hateful things to say about him. The writing style seemed to gear the conversations between characters towards social media speech. Instead of saying that Dinah snarled ” I hate you” it was written “I HATE YOU”; please realize that in social media speech caps= yelling. There was no good alliteration or symbolization between characters to each other. The real work of this novel went into the fantasy world of Wonderland itself. That part was phenomenal. The attire of the court, animals (mainly birds) are showcased, mannerisms expected in court are all portrayed to their fullest. My biggest issue with this novel was the predictability of what different characters will do when and what happens afterwards. Of course the future queen is in love with the stable boy. Of course she hates her sister. Of course she ends up having to run away. The book wasn’t bad but it was a very fast read with the amount of foreseen events just around the corner.